I bought some of the products and was surprised that one of the magazines had an article about the Major System — in Esperanto! My idea to try reading Lord of the Rings in Esperanto was thwarted when I took a look inside the book and saw that the Esperanto is more difficult than what I was reading in the Alice in Wonderland ebook on my phone. I decided to read Gerda Malaperis! and the entire Alice in Wonderland first. These look like good, logical choices for Esperanto. In English, the consonants ĵ and ŝ would be assigned to the digit, 6, but maybe it works better in Esperanto to have them assigned to zero. The article covers basic principles like exaggeration — for example, imagining a gnat (mosquito?) the size of a whale, with a pikilo (stinger?) as if it were going to drill for oil. So, maybe it wasn’t just wishful thinking when I created a section of the memory forum to discuss memory techniques in Esperanto. I mentioned that I’ve been going through Esperanto flashcards on Anki. The meetup involved a couple of hours of presentations in Esperanto. I had to introduce myself to the group in Esperanto, which was difficult, but I hope that people could understand me. My Esperanto speech is very slow and halting because I have to search for mnemonic images in my head for some of the words. I could recognize most of the words that people were saying, but I had trouble processing them into sentences at conversation speeds. I got the basic idea of most of the presentations though. One of the speakers spoke in very clear Esperanto, and I understood most of what he said. Overall, I was happy with my progress in Esperanto for the amount of time that I’ve spent on it. I just need more practice. When I got home, I looked at the book and noticed that Alice’s name was Alico instead of Alicio as in the ebook I was reading. It turns out that there is more than one translation of Alice in Wonderland in Esperanto. The Esperanto in the latter translation is more difficult, but I like some of the word choices better. I think that “la bordo de la rivereto” (the bank of the stream) seems more accurate than “la deklivo” (the hillside? ), and “bildoj” (pictures) seems more accurate than “desegnoj” (designs). I prefer this printed version that I just bought. If any fluent Esperanto speakers have an opinion of the translations, please let me know. I made a big mistake with the choice of this dictionary, since it is only English to Esperanto, when I only need Esperanto to English at the moment. I didn’t look at it well enough when I purchased it. I will have to get another dictionary before I start Alico en Mirlando. In the meantime, I will read Gerda Malaperis! (“Gerda Disappeared”), since I also got a wordlist for the entire book. It’s a mystery story that is designed to teach Esperanto to beginners. I also have all the words from the book in an Anki flashcard deck. If anyone else is reading Gerda Malaperis!, click here to check out the resources on Enrique’s site. Enrique offered me some suggestions by email as well as at the meetup yesterday, and he has been very helpful. His website is esperantofre.com. Also, if you are looking for Esperanto Anki flashcards, check out this page. There are more Esperanto decks there than I previously knew about, so it looks like I will have something to keep myself occupied in my spare time. The Propaedeutic Value of Esperanto — many studies over the past 100 years show that learning Esperanto speeds up the learning of additional languages. For example, if someone spends one year studying Esperanto and three years studying French, they will have a higher level of French after four years than someone who studied only French for the four years. If one wants to learn languages, it seems like a great idea to start with Esperanto. Esperanto has perfectly regular grammar, making it ideal for experimentation with memory techniques and languages. Esperanto is very useful for travel. I’m not a fluent Esperanto speaker yet, but have already met Esperanto speakers in a few countries and have had great experiences with the language. There are many Esperanto speakers worldwide, and they are generally very friendly and welcoming. You can find them in places like Lernu.net (over 100,000 members), Google+, and in many other places around the Web. If you would like to start learning Esperanto, check out the “16 rules of Esperanto grammar” to get a sense of the basics, and then browse through the resources on sites like Lernu! and esperantofre.com. >about the Major System — in Esperanto! You can write about any subject in Esperanto. Mirlando en traduko de Donald Broadribb en 1996. >I will read Gerda Malaperis! of the few words you have not already met. Miaopinie, mi preferas la unuan tradukon, pro ĝia fluo. Ne plaĉas al mi la longega frazo, kaj ĝi implicias tradukon tro laŭvorta. Ankaŭ, la uzo de ‘tedi’ eraras — ‘tedi’ estas du-liga (transitiva) vorto (ekz. ‘vi tedas min’ == you bore me) kaj estu ‘tediĝi’. ‘Deklivo’ povas signifi ‘klinita surfaco’ kaj ‘desegno’ povas signifi ‘pentraĵo’ aŭ ‘bildo de krajono’. (Reta Votaro aŭ (senhonta averto) La Simpla Vortaro) havas pli longajn, Esperantajn difinojn de ĉi tiuj vortoj. For what it’s worth, I much prefer the flow of the first translation. I don’t think the run-on sentence works well, and suggests an overly literal translation. The use of ‘tedi’ is incorrect too — tedi is transitive (e.g. ‘vi tedas min’ == you bore me) and ought to be ‘tediĝi’. ‘Deklivo’ can simply mean slope and ‘desegno’ can mean drawing or painting. (Reta Vortaro or (shameless plug) La Simpla Vortaro) have longer, Esperanto definitions of these words. Thanks… good points about deklivo and desegno. I didn’t know the multiple meanings. I had to read it a few times to understand that sentence, which is one reason that I thought the Esperanto in that version is a bit more difficult. Is La Simpla Vortaro your website? That looks useful. 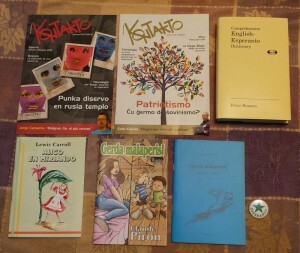 I will add it to the Esperanto resources wiki page. I’m far from being fluent in Esperanto, i’d probably call myself an intermediate-beginner, but from your examples i prefer the second example which i believe you said was from the book. The word choices seem much better and for me is much easier to understand.